In terms of postsecondary degree completion, the science, technology, engineering, and mathematics (STEM) landscape largely resembles American higher education on the whole. Despite more low-income students and underrepresented minorities seeking and completing STEM degrees, there remains great inequity between these groups and the country’s majority middle- and upper-income populations. In addition to racial/ethnic and socioeconomic classification, the dividing lines of inequity can also be drawn by geographical region. A recent report by the Brookings Institution Metropolitan Policy Program sheds comprehensive light on the current condition of America’s population centers by way of immigration, migration, households, and workforce (in addition to more traditional measures like race/ethnicity). Although not addressing the STEM education pipeline in particular, State of Metropolitan America: On the Front Lines of Demographic Transformation, speaks to social, educational, and industry settings in cities across the country—regions also home to potential generations of diverse STEM professionals. The report both confirms often discussed data on growing population centers while also pulling back the curtain on areas that lie beyond the country’s borders and inner-cities. According to the report, the greatest growth of Asian and Hispanic groups—the fastest growing racial/ethnic populations—between the years 2000 and 2008 occurred in just 10 metropolitan areas. These groups are also moving away from previous geographical strongholds and into metropolitan suburbs in unprecedented numbers. In short, the country’s populace landscape continues to change, thus necessitating a parallel change in the way researchers, policymakers, and practitioners approach STEM education and workforce advancement. Particularly when it concerns just where and when diverse students enter STEM higher education. Fortunately, positive change is occurring at the local level. Federal agencies and philanthropies that focus on K-20 STEM outreach often utilize a community-based model. Such efforts focus on high-need school districts where science laboratories are in dire shape or are non-existent and where a lack of STEM role models is great. Such endeavors foster linkages between two- and four-year institutions, supported by both local industry and community leadership. The bottom line is this: STEM education policy needs to move beyond a single system or institution. A collective effort—between two- and four-year institutions, public and private, and K-12 and postsecondary education—will create the change that single-approach solutions fail to assemble. This collaboration must also occur in conjunction with local industries and within metropolitan spaces. And like metropolitan spaces—and indeed like the STEM pipeline itself—we cannot allow policy solutions to take action within state borders alone or within any one geographical or institutional setting. Given the role of education research in policy shaping, there must also be a more concerted effort on behalf of the higher education research community to think beyond the input categories of race/ethnicity and socioeconomic status. After all, the families, neighborhoods, and schools from which the nation’s children are borne and educated have paramount influence on their education trajectory. Such highly nuanced environments are difficult to measure, often resulting in their exclusion from national datasets and subsequent studies. When these contexts aretaken into account—particularly when mixed methods are utilized—findings are overshadowed by the dominant discourse on race and income. As such, the diversity discourse needs to be broadened. This means posing 21st century questions and designing and utilizing data that capture student movement across geographical and institutional borders. It also means inserting effective education policy at the intersections of research and practice as well as the intersections of other social systems. Only then will we facilitate the change we seek at the speed we require. Dr. Lorelle L. Espinosa is the director of policy and strategic initiatives at the Institute for Higher Education Policy, a Washington, D.C.-based independent, nonprofit organization that is dedicated to increasing access and success in postsecondary education around the world. The Texas Center for Education Policy and its partners are excited to announce the upcoming annual state conference “Leading the Nation: A Texas Retrospective on Educational Reform” to be held February 9, 2011 at the Austin Hilton downtown, 9am to 4pm. The public event will convene thought leaders from the education, government, business, community, and non-profit sectors with a demonstrated interest in issues of accountability and assessment to identify areas where education reform has a significant impact on education. The Honorable Paul Sadler, Former Chair, Committee on Public Education, Texas House of Representatives will deliver the luncheon keynote. He will be followed by David Hinojosa, Esq., of Mexican American Legal Defense and Education Fund, who will discuss the condition of education for English language learners in the state of Texas. The $30.00 conference fee includes a light breakfast and plated lunch. For more information, contact Dr. Angela Valenzuela at (512) 471-7055. Seating is limited so register today! School Finance Reform in Texas: A Never Ending Story? This is an excellent article [pdf] on School Finance Reform in Texas authored by Economics Professors Jennifer Imazeki (San Diego State University) and Andrew Reschovsky (University of Wisconsin-Madison). Like I just posted... Texas matters! Another really good article by Verstegen, Venegas, and Knoeppel on the financing of our public schools. This is also a good resource for considering as we consider the dynamics that drive states like Arizona and West Virginia toward reactionary policies. I'm happy to share this really excellent report [pdf] that considers the impact of states like Texas to genuinely lead our nation—for better and for worse. This helps us to consider that what we do here in Texas really matters and has the potential, indeed, to change the world. Although the outcome of this legislative session could prove me wrong, the value of this—at least partially—is to help dispel myths that Texas is a backwater state. The record points to several positive, powerful impacts on the nation through jurisprudence and state law about which we should be proud. This record helps us to know our history and to be better decision makers today. A report by the nonpartisan Texans Care for Children finds that glaring social problems borne by Texas’ children have resulted from its state government’s policies. The nonpartisan Texans Care for Children reports that Texas children are falling behind the rest of the country in nearly every aspect of child well-being. Merely mentioning the state’s name evokes a vision of wide-open spaces, rugged independence and, most importantly, unrivaled economic prowess. It looks like Texas’ longtime model of cutting spending and never raising taxes works exceptionally well, so it’s not surprising that many states are following Texas’ lead. But it’s less obvious that the state’s fiscal policies and widely admired approach to balancing its budget have created a devastating legacy. According to officials at Austin-based Texans Care for Children, a multi-issue, nonpartisan policy organization, Texas children are falling behind the rest of the country in nearly every aspect of child well-being. For years, services that benefit Texas’ most vulnerable citizens have been the repeated target of state budget cuts. Study after study has warned about the perils of inadequately providing for the future of Texas children. The latest, “A Report on the Bottom Line: Conditions for Children and the Texas of Tomorrow,” was released today by Garcia’s organization. The cumulative impact of previous budget cuts has put Texas children behind the rest of the nation. When compared to children in the rest of the U.S., a Texas child is 93 percent more likely not to have access to health care, 33 percent more likely not to receive mental health care services, 35 percent more likely to grow up poor, and 16 percent more likely to drop out of school. Given that Texas is not a poor state — its citizens’ median wealth ranks 27th out of 50 — the dire status of its children is all the more startling. Texas ranks third among the seven worst states in overall child well-being, according to the advocacy organization Every Child Matters; the other six states are the nation’s poorest. Experts like Rice University professor Stephen Murdock, state demographer under former Gov. George W. Bush, sounded the alarm years ago. Today, Murdock warns that if Texas doesn’t correct course soon, the next generation of Texans will have less education, less wealth and shorter life spans than the generation before. Education, he says, is key to overcoming differences that exist between minority children and the rest of America. For Texas, adequately funding education is crucial because of the state’s shifting demographics — the white student population in Texas is declining while the number of African-American, Asian and Hispanic students is rising. The Texans Care report points out that inadequate state funding — not immigration — drives the state’s poor outcomes for “minority” children. Murdock agrees. “Most Hispanics in Texas have been here for generations; they’re natives of Texas, citizens of Texas and of the United States,” he says. Cutting waste and improving efficiency have always been part of the Texas culture. But the complexity of the social issues Texas faces has grown. “The social problems we as a state have ignored don’t go away just because we don’t choose to focus on them,” Garcia says. Check out the Senate's proposed budget as well as the LBB's Summary of Legislative Budget Estimates and the LBB's full Legislative Budget Estimates. Might be less severe than the House version though no less fatal. Education not slashed as deeply, but plan still cuts 15% from current budget. The Texas Senate on Monday delivered a state budget proposal that cuts a little less from education and other programs than the version released last week by the House of Representatives. But the upper chamber's $158.7 billion budget proposal, which is $2.3 billion bigger in overall spending than the House bill, still whacks 15 percent from the current two-year budget. The spending differences between the two proposals, however, are dwarfed by the huge challenge facing lawmakers as they attempt to close a massive budget hole without raising taxes or accessing the $9.4 billion rainy day fund. Given that challenge, the Senate will begin hearings on the 2012-13 budget bill next week, said state Sen. Steve Ogden, the Bryan Republican who was reappointed chairman of the Finance Committee on Monday. "I know it's urgent," said Ogden, who crafted the Senate proposal. "I think the best thing we can do here in the Senate is to get started." House Speaker Joe Straus has not yet appointed committees, which will need to happen before House members can take up its budget bill. The quick start is well advised, said Dale Craymer, president of the business-backed Texas Taxpayers and Research Association . The Legislature will have to change state law in order to make the level of cuts to public education and Medicaid that lawmakers assumed when creating the proposals. Such cuts won't be politically popular, so budget-writers will need to build a consensus to make them happen, Craymer said. "This go-round is a much more political exercise" compared to past legislative sessions, Craymer said. "The stakes are clearly much higher, the decisions are much tougher. You've got to be willing to say there are some things that we can do without." Texas will also have to get approval from the federal government to make the planned changes to Medicaid, a formidable task given the strained relationship between the Obama administration and state leaders. "Texas has a lot of company in seeking change," said Craymer, noting that many other states are in similar budget straits. The Senate budget anticipates some extra federal money coming to Texas to pay for Medicaid, which would free up some state dollars. It also uses some dedicated fees to pay for general operating expenses. In relative terms, public education benefited the most from the additional money in the Senate budget. Direct aid to school districts would be reduced by $9.3 billion rather than the $9.8 billion in the House version. Some education programs that were nixed by the House, including pre-kindergarten funding and teacher incentives, got $400 million, far less than the $1.8 billion in the current budget. Cuts to higher education were not quite as deep in the Senate proposal. Four community colleges axed by the House got a reprieve in the Senate. And the Senate proposes to erase about 1,400 fewer state positions than the 9,600 cut in the House version. The Texas Legislature allocated enough money for 86,830 college students to receive the need-based Texas Grant in the current academic year. Under the proposed House and Senate budgets, the number of students receiving the state's main form of financial aid would decline to 27,135 by 2013. That's because funding would be cut 41 percent, to $366 million, for the upcoming two-year budget, closing the program to students entering college but allowing those already receiving the grant to continue to do so. The state's other financial aid programs also would take substantial hits. Work-study aid would be cut 41 percent. A scholarship program for students ranking in the top 10 percent of their high school graduating classes would be cut 79 percent. All told, spending on financial aid — just over $1 billion in the current two-year budget — would decline by $431 million under the House proposal for 2012-13 and by $381 million under the Senate version, according to the Legislative Budget Board. Higher Education Commissioner Raymund Paredes, who had asked the Legislature to increase financial aid in light of growing enrollment, expressed a mixture of dismay and optimism Monday. He noted that much of the enrollment growth involves students who are poor, the first generation in their families to attend college, and Hispanic or members of other minority groups. "I am hopeful that we can make a compelling argument that we have an awful lot of poor students coming through the system, and they won't be able to go to college unless we provide some financial aid," Paredes said. "It would be tragic if we have to tell these poor, first-generation students of color as they're showing up in high school graduation classes that we've run out of money." It's not as if Texas has been generous with financial aid all along. Paredes' agency, the Higher Education Coordinating Board, estimates that only about 70 percent of students meeting financial and academic eligibility requirements currently receive a Texas Grant. That's despite the fact that lawmakers increased spending on financial aid by about 35 percent two years ago. Thomas Melecki, director of student financial services at the University of Texas, said eliminating Texas Grants for new students would keep some of them from enrolling. Currently, about 4,800 UT students receive a Texas Grant, including about 1,200 freshmen. UT would try to redirect other grants to students who would otherwise receive a Texas Grant, as well as put more loan money into their financial aid packages, Melecki said. Many low-income students are leery of taking out loans, which, unlike grants, must be repaid. A Texas Grant can be worth as much as $6,780 a year for a student at one of the state's universities, said Andy Kesling, a spokesman for the Higher Education Coordinating Board. Only students whose families can afford to pay no more than $4,000 toward their education are eligible, he said. The maximum grant for a community college student is $1,780. Lashaila Mitchum, a sophomore majoring in social work at UT, said of her Texas Grant, "It makes financial hardship a little more sustainable." She predicted that many students wouldn't apply for admission if the grant program is closed to entering students. "How can you expect people to work, pay taxes and be productive citizens if they can't go to school?" Mitchum said. Two years ago, the Select Commission on Higher Education and Global Competitiveness, a panel authorized by the Legislature, noted that insufficient financial aid can prompt students to forgo college or to spend too much time working while they are enrolled. Nationwide, only 8 percent of freshmen who work full time earn a bachelor's degree within six years. In Texas, 35 percent of undergraduates work full time, the commission reported. Rep. Mike Villarreal, D-San Antonio, referring to GOP majorities in the House and Senate, said: "The Republican budget proposals read like blueprints for making college more expensive. By eliminating financial aid for new students, and pushing up tuition through cuts to colleges, the Republican proposals would put higher education and high-paying jobs out of reach for tens of thousands of young Texans." GOP leaders say the proposals are intended to ensure that the state lives within its means. The proposals avoid new taxes and use of the rainy day fund. Something that comes to mind is how university faculty and doctoral students would cringe at the idea of graduate-level courses having the class sizes that we are unapologetically proposing to impose on children. I hope the masses come out to voice their opinions on this issue. With budget savings in view, the full-court press is on in state legislatures to deny that smaller class sizes help students do better. Tight state budgets are forcing the "science," the rationalizing of larger class sizes. In reality, we are talking about the whims of policy makers who can only guess what it actually takes to "leave no child behind." As a parent, it always was simple intuition to me that a smaller class made a difference. Then one day I saw it in reality — as a teacher. My intuition now tells me that those who trivialize class size aren't as interested in student success as their dime-store slogans say. In Texas, state Comptroller Susan Combs has advocated removing a long-mandated 22-1 student-teacher ratio in grades K-4. Her plan would eliminate 11,900 teaching positions statewide. Combs' report states that classes with a 25-1 ratio "could operate without any loss of instructional effectiveness." Well, it depends. What kind of class are we talking about? If the issue is the basic skills that second-graders need to compete with Taiwanese second-graders, Combs' claim is specious at best. How do I know? Because I saw how a smaller class benefited one particular student on a basic skill in a rare snow day in the Sun Belt. That February day, a dusting left Central Texas streets slippery. About half the students in my 8 a.m. developmental writing class at the community college stayed home. Remarkably, among those who showed up was one I least expected. Call him Tony. Tony ultimately would not pass the course, for he would find just about any atmospheric event as grounds not to attend. And when he was there, he made himself invisible. On this snow day, Tony could not hide. And I had to teach something to someone. To my surprise, when it was him and me, Tony and I were connecting, and he was learning. I felt a great buzz. I knew Tony could succeed in my class. I felt he believed the same. It didn't happen, partly because of his poor attendance and partly because with a typically large class, in no way could I address his needs to make the requisite difference in his instruction. But the snow-day experience pointed out the absurdity of the claim made by people who say class size doesn't matter. Of course it does, particularly when the emphasis is on the basic skills on which schools are hammered by state policy makers — math, writing, reading. These are endeavors in which the teacher needs to go around the room and make sure everyone is on the same page. Class size matters. Anyone who believes otherwise ought to try saddling up 25 mounts from differing starting points and riding them to one destination. This article highlights the important factor of district-level savings accounts. While not all districts have them, there are some who were called out during the Select Committee on School Finance interim hearings. Savings account figures were quite high for some districts present and the response from committee members was explicit-- they were livid. Be prepared for this to make its way in the budget discussion as well as the soon-to-be filed school finance legislation. In Austin, top Republican lawmakers are touting a no-new-taxes budget that avoids dipping into the state's rainy-day fund. Local school leaders, stunned by the magnitude of the cuts reflected in the Texas House's base budget, fear they will have to rely on the opposite strategy — reluctantly — to balance their own spending plans. "They don't want to spend their rainy-day fund," David Anthony, superintendent of the Cypress-Fairbanks school district, said of state lawmakers. "I'm not sure why we would want to spend ours." But Anthony said his district and others across Texas won't be able to avoid tapping into savings if the cuts to public education are as deep - up to $10 billion - as the House proposed this week. Some school officials also are considering even more unpopular options - increasing property tax rates or eliminating special tax breaks. In some cases, even those moves aren't expected to raise enough money to plug the worst-case budget holes. "Right now, nothing is off the table," said Candace Ahlfinger, a spokeswoman for the Pasadena Independent School District, which could lose between $32 million and $53 million under the initial House budget plan. Under a 2006 state law, districts must ask voters for permission to increase the tax rate by more than a few cents, and the overall rate is capped. Jackie Lain, who lobbies on behalf of school districts, said they would have a particularly tough time winning voter approval for a tax hike now. "How do you sell, as a locally elected official, a tax rate increase when the Legislature has said no new taxes?" asked Lain, the director of governmental relations for the Texas Association of School Boards. "It would be a very hard sell. That's like selling ice to Eskimos." Pasadena ISD - as well as Houston ISD, Spring Branch ISD, Cy-Fair ISD and about 200 other districts - have another way to increase revenues. Their school boards could decide to eliminate a special tax break, known as the optional homestead exemption, they have chosen to give property owners. Anthony, the Cy-Fair superintendent, asked school board members to slash the district's 20 percent exemption in half last year, but they voted down his proposal. He said Thursday that he didn't plan to try again. "That's not fair to our taxpayers," he said. In HISD, the optional homestead exemption saves property owners more than $100 million a year, according to Melinda Garrett, the district's chief financial officer. District officials have not suggested revoking the exemption, and Garrett told the school board Thursday that it wasn't clear how much money could be gained by taking this step. Under the House budget proposal, HISD could lose between $203 million and $348 million - up to a fifth of its budget - according to estimates from a consulting firm. Garrett told the school board that she didn't expect the House plan to be the final word but said the district had to prepare for the worst. She said the board could decide to increase the tax rate by a few cents without going to voters because the district hadn't hit the limit yet. Dipping into the district's savings accounts - which total about $285 million - is another option, Garrett said. Texas Comptroller Susan Combs suggested in a school-finance report in December that districts that maintain excessive fund balances, or savings, should be punished with less state funding. In 2009, more than half of the state's districts had more savings on hand than the Texas Education Agency recommends, according to Combs' report. It did not mention individual districts. HISD Trustee Carol Mims Galloway proposed that the district increase revenue by soliciting advertising on school buses. A plan is in the works, Garrett said, but HISD Superintendent Terry Grier chimed in with a grim reminder. "You could sell naming rights to football stadiums and wings of schools and buses," Grier said. "That's not going to solve our problem." Some response to last week's LBB proposed budget (HB 1). I'm sure this is just the beginning. I hope our media also prioritizes community voice and opinion on this issue. You can download the entire proposal and specific exec. summaries at an earlier post on this blog. 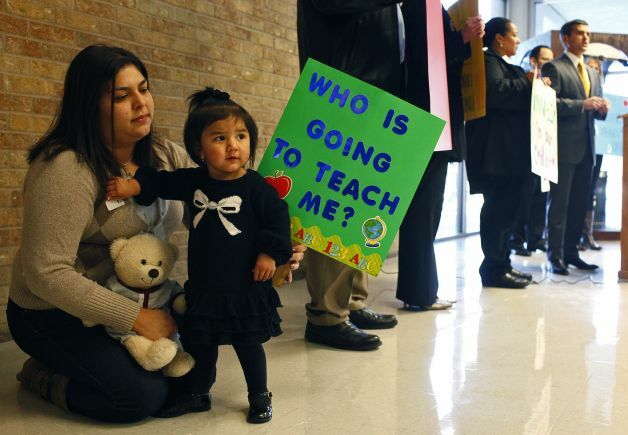 Danielle Gonzalez, who's studying at the University of the Incarnate Wordto be an educator, sits with 16-month-old niece Aliana Chavez during a news conference by state Rep. Mike Villarreal to talk about the impact the state's base budget bill on schools. Flanked by local educators, students and parents, state Rep. Mike Villarreal, D-San Antonio, on Friday blasted a proposed state budget that over the next two years would cut nearly $14 billion in spending on public K-12 and higher education. On Tuesday, GOP leaders released a bare-bones budget that would balance a shortfall of at least $15 billion with deep cuts to education, including cutting funding for four community colleges, yanking financial aid for incoming college students and eliminating grant funds for prekindergarten, high school completion programs and science labs. The base budget proposal does not account for growth. Taking into account swelling school and Medicaid rolls, some put the gap at $27 billion. GOP leaders have pledged to balance the budget with no new revenue and without dipping into the state's rainy day fund. “It's impossible. It's a total failure by the state to maintain the infrastructure that supports our economy,” said Blakely Fernandez, a trustee for the Alamo Colleges. If the cuts stand, Fernandez said local school districts and community colleges may be forced to raise property taxes. “Money is going to have to come from somewhere. This is a push-down program,” Fernandez said. The largest chunk — $11.6 billion — would be cut from K-12 education. Higher education would lose $2.1 billion, according to the Legislative Budget Board. Francisco Cigarroa, chancellor of the University of Texas System, called the cuts “dramatic and deep” and said they would result in more layoffs, enrollment caps and the elimination of entire programs at the system's nine universities and six health science centers. The cuts “will have immediate and future devastating consequences for our students, patients, faculty, staff and the communities of Texas,” Cigarroa said in a statement. The budget also shuts out new students from TEXAS grants, the state's chief financial aid program for needy students. Offering only renewals, the grants would serve 85 percent fewer students over the next two years. The cuts will “make college more expensive and financial aid more scarce,” Villarreal told a group of journalism students at Brackenridge. School districts could lose 100,000 jobs, according to school finance expert Lynn Moak. Betty Burks, deputy superintendent of SAISD, said the district would likely cut prekindergarten programs to a half day rather than a whole day, one of many tough decisions they will be forced to make. “This is a crisis for SAISD. We are the heart of the city,” Burks said. Elaine Mahler, the grandparent of two children at Hawthorne Elementary, said she moved to the United States from Belize to give her children a better education. It angers her to see politicians “playing games” at the expense of children's education. Denise Barkhurst, president of Big Brothers Big Sisters of South Texas and a parent of two children in the North East Independent School District, said Texas already ranks in the bottom nationally when it comes to education spending per pupil. Community colleges threatened with closure include Brazosport College in Lake Jackson, Frank Phillips College in Borger, Odessa College and Ranger College. The measure would save $39 million and affect nearly 12,000 students. According to a blog on Brazosport College's Web site, school officials found the announcement “very puzzling,” citing record enrollment in 2010. Villarreal blamed the crisis on an unsound budget structure and said he is proposing a series of measures to overhaul the tax code and close loopholes. Given the immediate crisis, however, nothing is off the table, including ideas to consolidate school districts, university systems and state agencies such as the Coordinating Board and the Texas Education Agency. Waxing psychological, Villarreal compared the crisis to the stages of grief, starting with denial of the impending shortfall. From there, Texans have moved to anger and will soon begin bargaining, using accounting tricks and Band-aids to try to cover the gap. A period of depression almost surely will follow before lawmakers reach acceptance, he said. Mayor Julián Castro will take an active role in local school board elections and superintendent appointments, he said in an interview Saturday outside SA2020's final community workshop, one in which education was heralded as key to the city's future. “I envision, for instance, coming up with a system of measuring the progress of these urban school districts in a mayor's scorecard on their progress and holding them accountable for student success,” he said. “I believe that getting more involved in ensuring that there are knowledgeable and strong board members at these school districts needs to be a part of my job. “I'm looking for every opportunity to champion those superintendents and what they're doing,” he said. Recently, San Antonio Independent School District Superintendent Robert Durón notified the board's president, as his contract requires, that he has applied for another job. His 41/2-year tenure with the district — which already has exceeded the average for urban school superintendents — has been marked by increased test scores, a lengthy effort to close schools and the recent passage of the district's largest bond to date. But SAISD continues to struggle with a high dropout rate and low state ratings, and Durón's relationship with trustees sometimes has been strained. If Castro indeed weighs in on SAISD elections, he potentially could have a significant impact on the shape of the board. Trustees Olga Hernandez, Tom Lopez and board President James Howard all have seats up for election in May. Lopez, the longest-serving board member, said he wasn't concerned by Castro's plan to beef up his involvement in the city's schools, including a “mayor's scorecard” for area districts. “We're evaluated from all different angles, all different perspectives,” Lopez said. He was shocked, however, by news that Castro also intends to get involved in school board elections. In the interview, Castro said he would support former Councilwoman Patti Radle should she throw her hat in Lopez's District 5 race. “I don't know, that kind of catches me by surprise,” Lopez said, noting that he always has supported Castro. Radle said Saturday afternoon that she'd been asked by several community members to consider a run for the seat, and she's doing just that. Radle said she wasn't concerned by Castro's efforts to become more involved in school board elections. Char Miller, a retired Trinity University urban studies professor now at Pomona College in California, said Castro is kicking down the wall that's always stood between mayors and independent school districts. Miller said previous mayors have used the bully pulpit of their office to advocate for change, “but there has never been such a direct insertion by a mayor of the mayor into school board elections and the like, which is kind of astonishing. “I can only imagine the conversations that are taking place in all of those school boards and superintendent offices,” he said. On Saturday, as about 1,000 people wrapped up SA2020, Castro's collaborative long-term planning effort, it was clear that for San Antonio to succeed during the next decade, improving education would be pivotal. During the session, participants discussed how to connect seemingly disparate issues — from downtown development to economic competitiveness and family well-being. Ann Stevens, president of BioMed SA, said education “is the river that runs through our lives and binds us together as a community.” Several other speakers, representing the collective thoughts of their working groups, pointed to a strong education system as a game changer — a daunting task made more difficult by looming state budget cuts in the Legislature. For the past several months, thousands of San Antonians have come together to help craft the community-driven vision. SA2020 leaders, such as Daryl Byrd — one of the project's three chairmen — said pointedly that the thrust of SA2020 encompasses everyone here, “from the board room to the family room.” Rackspace Hosting's Graham Weston, also a SA2020 chairman, said that what happens after the visioning process is what will determine whether the project is a success. As implementation begins, if SA2020 is to be deemed successful, it'll be because governmental agencies — including the independent school districts — the business community, the nonprofit world and the public all work together. The SA2020 document will play a role in selecting projects for the city's 2012 bond program, and Castro said the planning project's priorities must be embraced by Bexar County, the school districts and other sectors of the community. Castro told an impassioned story about when he and his twin, state Rep. Joaquín Castro, were headed to California to enroll at Stanford University. Only their second time on an airplane, the brothers cried all the way to El Paso. About a month later, they were back (temporarily) on their mother's doorstep. It was an intangible attraction to San Antonio that had the Castro brothers pining for home, and now, the mayor wants to foster that same attraction for others to make this city the great place he thinks it can be. I encourage all of you to give the LBB's proposal (HB 1) a close read. The cuts to public education are devastating and even worse for higher ed. The Texas House opened the conversation on state spending Tuesday with a $156.4 billion budget that's $31.1 billion smaller than its predecessor, a drop of 16.6 percent from the current two-year spending plan. The cuts are deep, but the proposed budget doesn't call for an increase in taxes or tapping the state's $9.4 billion Rainy Day Fund. The budget was released to legislators on Tuesday night and is now available to the public online. The Senate will follow with a proposal of its own next week — lawmakers say the differences are relatively small. And Gov. Rick Perry says he'll follow with his own proposal before his State of the State speech in the first week of February. The state's current budget totals $187.5 billion, including $88.5 billion in general revenue. The proposed replacement, prepared for the House by the Legislative Budget Board, totals $156.4 billion, including $79.3 billion in general revenue. General revenue is the part of the budget over which lawmakers have direct control; the remainder consists of federal and other funds. In this proposal, general revenue spending would drop by 10.4 percent from current levels. Estimates of the state's budget shortfall — the difference between the amount of money needed to fund the state and the amount that's actually available — range from $15 billion to $27 billion. Going from this proposal, there's no shortfall in the state budget at all. The House's initial plan cuts spending in virtually every area of government and doesn't include funding increases that would cover current services, population growth and inflation. The health and human services portion of the proposal would cut Medicaid provider rates — what doctors and hospitals and others are paid — by 10 percent. And it doesn't include funding for population growth or for increased costs or utilization rates. There's also a $4.3 billion cut included to account for the federal stimulus money used in the current budget that's not available for the next budget. The proposal would cut a total of $16.1 billion in health and human services spending. That's a 24.6 percent cut. Public education spending would drop, too. The notes included with the proposal say it falls $9.8 billion short of the amount needed under current school finance formulas, which means that the Legislature will have to alter them or find the money. The proposed budget doesn't include funding for increased numbers of students, for projected declines in property values and related local school taxes, or $3.3 billion in the current budget from federal stimulus money. Public education spending would drop a total of $7 billion from current levels. Higher education would be cut $1.7 billion, or 7.6 percent, from current levels. The House proposal chops $3.3 billion from the business and economic development section of the budget, a 14.3 percent drop. Public safety and criminal justice would lose $1.5 billion from current levels, a 12.7 percent drop. The LBB, which guides lawmakers as they write the state's budget, also revealed its long-awaited recommendations for how to save and raise money to help balance the 2012-13 budget and make the state function more efficiently, from lifting the ban on Sunday liquor sales to tying the summer sales tax holiday to the state's financial condition. Here are the headlines from the LBB's Government Effectiveness and Efficiency Recommendations. — Move administration of the Texas Economic Development Act. Allow the comptroller — instead of local school districts — to negotiate property tax breaks based on economic development and separate wind farms from other development categories. — Reduce the time money sits idle in bank accounts. Shorten the amount of time bank deposits and other instruments lie dormant before going into the state's unclaimed property funds. Worth $72 million to the state. — Make it easier to understand state and local government borrowing. Increase the transparency of the state's constitutional debt limit so people can see how it's calculated and how close the state is to its borrowing capacity. — Steer veterans to benefits that aren't state-funded. Use national public assistance databases to make sure veterans in Texas aren't using Medicaid — which costs the state money — for benefits that are available from veterans programs that don't use state money. — Strengthen regulation to improve food safety. Coordinate food safety regulation between the four main agencies involved to cut down on the 6 million cases of food poisoning reported each year in Texas. — Consolidate the state's poison control centers. There are six now; merging them into one would save $2.6 million annually. — Raise prices for storing documents for local governments. The state's archives aren't covering their costs with current pricing, and doing so would cut $1.6 million from state spending. — Charge state employees for parking in state garages. The state could bring in $5.5 million every two years, the LBB estimates, if it charged state employees as it now charges visitors who don't work for the state. — Address solvency of the state's employee and teacher retirement systems. This doesn't have a number on it, but LBB presents three options: Fully fund the systems, which would require the state (and possible the members) to spend more money; lower benefit levels to fit the amount of funding currently in those plans (which the LBB emphasizes are solvent and in better condition than many of their counterparts elsewhere); or create a hybrid plan that would, for instance, provide different benefits for existing and new members. — Raise insurance premiums for state employees who use tobacco. This one would save $24.5 million by adding a surcharge of $30 per month for people who smoke or chew tobacco. And it would extend the idea to members of the Teacher Retirement System and the state's biggest university systems — the University of Texas and Texas A&M. — Change coinsurance rates for state employees. Using tiered rates would cost employees more for higher-priced procedures while lowering the percentage they pay on lower-cost care, saving the state $59.7 million. — Create a voluntary pill-splitting program. A voluntary program for state employees that would let them buy prescription pills with twice the recommended dosage and splitting them in half at home would save the state $710,190 in the next biennium, according to the LBB. — Charge state retirees extra to keep current health benefit levels. The state could save $95.5 million if it charged retirees to pay part of their insurance premiums based on their years of service, and if it lowered the state's subsidies for those retirees' dependents to 40 percent of their premiums (it's 50 percent now). — Watch the streamlined sales tax. It would cost Texas $88.3 million to change state laws to conform to a national standard on origin-based taxes (the idea is that the state should be able to collect sales taxes for items bought online or through mail order from out of state). But if Congress enacts legislation that allows states to require sellers to collect those taxes, the state could net $500 million a year in new sales taxes. LBB filed a report on this without making a recommendation. — Shrink the discounts for paying sales taxes early. This would save $152 million by limiting the so-called timely filer discount for businesses that remit taxes on time, and the discount rate for sellers that prepay their sales taxes. — Tie the August sales tax holiday to budget conditions. This would save $111.8 million by canceling the sales tax holiday in August 2011 and 2012 and by then conditioning it on the health of the state budget. If the state has a surplus in 2013, there would be a holiday, and if available revenue for the 2014-15 budget — the one that'll be written in two years — is greater than available revenue now, then they can have the holiday then, too. — Repeal restrictions on Sunday liquor sales. Getting rid of the state's ban would increase revenue from state alcohol and sales taxes by $7.4 million. Texas is one of 14 states that don't allow hard liquor sales on Sundays. — Lose the exemption on hotel taxes for permanent residents. Hotels don't charge occupancy taxes on people who stay for 30 days or more. If they did, the state would bring in another $16.1 million in taxes every two years. — Reduce Medicaid patients’ reliance on emergency rooms. The LBB says redirecting patients with non-emergency conditions from the ER to a clinic could save $184.2 million a year. They suggest physician incentive programs, making urgent care centers Medicaid clinics and encouraging Medicaid managed care to put tougher restrictions in place. — Decrease the number of state-supported living centers. The state could save up to $16.4 million in the next biennium by closing at least one of its state-supported living centers, the LBB says. Another recommendation calls for improving care at Texas’ 13 institutions, which are now being monitored by the U.S. Department of Justice. — Strengthen certified nurse aide training. The LBB recommends that lawmakers increase the training required of nurse's aides in nursing homes. Twenty-six states require more education than the federal minimum standard, and Texas isn't one of them. — Improve abuse reporting of licensed professionals. Although state law requires state agencies to report misconduct by nurses to the board that licenses them, it's not happening consistently. From fiscal years 2005 to 2010, just a quarter of nurses at state-supported living centers and 33 percent of nurses at state hospitals who had committed confirmed acts of abuse were reported to the Board of Nursing. — Establish a supervised re-entry program to reduce costs and improve efficiency. The LBB is recommending that lawmakers consider closing one or more prison units. That's a big deal, because tough-on-crime Texas has never closed a prison. The board says the state could save up to $33 million in the next biennium if the Texas Department of Criminal Justice does a better job of helping released prisoners stay out of the big house, reducing prison population. — Eliminate statutory barriers to contain costs in correctional managed health care. The LBB says the state could save about $1.2 million in the next biennium by improving health care processes in prisons, like prescription drug distribution and dialysis treatments, and by allowing more really sick and really old prisoners out under the Medically Recommended Intensive Supervision Program. The LBB says that in fiscal year 2009, 74 offenders died while awaiting review for medical parole. — Solicit park donations. The LBB recommends amending the limits on private contributions to state parks to enable the development of corporate partnerships and promotional campaigns. It also suggests mimicking states like Washington, which asks for a voluntary $5 donation with vehicle registration, to raise more support for state parks. — Improve traffic safety by banning the use of wireless communication devices while driving. This ought to make state Rep. Jose Menendez, D-San Antonio, happy, since he's tried session after session to ban cell phone use while driving. The LBB says Texas could save lives and generate about $2.3 million by making it illegal to use your mobile device while driving, and also making it an offense under the much-maligned Driver Responsibility Program. — Develop and operate a state health insurance exchange a la federal health care reform. LBB says creating a marketplace for health insurance would increase the availability of affordable coverage for Texans. Plus, the federal health reform signed into law last year requires it — and if the state doesn’t do it first, the feds will do it for Texas. The version the LBB recommends would be a quasi-independent state agency overseen by the Texas Department of Insurance. — Monitor outcomes and limit course offerings to ensure dual credit course equality. With the state’s encouragement, enrollment in courses that provide both high school and college credit has been skyrocketing. To ensure the quality of these courses, the LBB would like the Texas Higher Education Coordinating Board to more closely monitor and analyze the outcomes of such programs — and see to it that courses like physical education are not eligible for funding. — Strengthen financial oversight of community colleges. The LBB wants to put community colleges on more solid financial footing. It calls for an annual report on the condition of the state’s community colleges based on financial indicators. — Improve the effectiveness of the Texas common course numbering system. The recommendation would make it easier for students to transfer course credit between state universities and community colleges for their core classes. The LBB recommends guaranteeing transfer credit for all courses in the Texas Common Course Numbering System if the university offers an equivalent course. — Limit subsidies for AP exams. The Texas Education Agency currently provides a $30 per test subsidy to help cover the costs of public school students taking Advanced Placement and International Baccalaureate exams as an incentive to increase students' participation and success. The LBB says restricting that subsidy — which while increasing participation rates has not increased students' success rates — only to low-income students would save the state $18 million in general revenue. — Increase monitoring of alternative schools. In 2007, the Legislature enacted standards for alternative schools — but the TEA still doesn't monitor or enforce the standards beyond examining compliance with placement, suspension and expulsion requirements. LBB says the TEA should use performance measures to make sure alternative schools are meeting the standards. 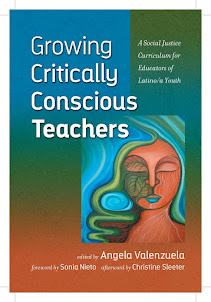 — Enhance teacher retention programs. In Texas, the least-experienced educators teach in the districts with the most economically disadvantaged students — and the state doesn't have any programs that address specifically the retention problem in those districts. Among the incentives LBB suggests are giving priority for loan repayment assistance to teachers in hard-to-staff districts. This is a must read. We're already seeing the horrible cuts to education here in Texas with the House LBB's proposed HB 1. I encourage all of you to give it a close read. The cuts to public education are devastating and even worse for higher ed. Count up activities and community service? Check. Have three or four college courses already under your belt? For students hoping to get accepted at higher-end colleges, taking a few Advanced Placement courses — accelerated high school classes that count for college credit depending on how students score on a standardized test — is no longer a nice add-on to college resumes. It’s the norm. “It’s getting to the point when you don’t see AP courses on a student’s resume, you wonder why,” said Bill Brown, vice president of enrollment at Lebanon Valley College in Annville Township. Nationally, the Advanced Placement program has grown exponentially since it was introduced in the 1950s. The number of U.S. students taking AP exams jumped about 50 percent in the last five years, from 1.2 million to 1.8 million, according to the College Board, the agency that oversees AP programs and other standardized testing such as the SATs. On average, students have access to eight or nine of the 34 AP courses offered by the College Board. They range from calculus to art history. Several midstate schools are nationally recognized for being far ahead of the pack. Cumberland Valley High School leads with 27 course offerings. That’s more than double the 13 courses the school had in 2005. Hershey High School offers 21 courses, and West Shore School District’s two high schools each offer 17. Camp Hill High School offers 10, and about half of its students are enrolled in AP courses. About half of college-bound students take an AP course, said Trevor Packer of the College Board. “It is very much the norm for students going to selective or highly selective institutions to have taken at least one college-level course,” Packer said. John Chopka, vice president of enrollment at Messiah College in Upper Allen Township, said AP courses on a resume show a drive to succeed that can be hard to determine from college essays or other parts of an application. “There’s just a little extra dose of motivation that comes with deciding to take an AP course,” he said. But can there be too much? Parents expressed concern at a November Cumberland Valley School Board meeting that the district encouraging AP courses even for freshmen could be stressful for students. The district was looking to cut an honors freshman social studies course so students would be more inclined to take the AP equivalent. There would be an advanced course beyond the college prep track, but it wouldn’t have an honors weight. Administrators responded to parents’ worries at the meeting by saying that if students are motivated to take the honors course, why not take it a step further with AP? McKinley, whose daughter is taking the freshman AP social studies course, said she’s thrilled with the school’s AP program but wants to see other good options for those who aren’t ready to tackle the college-level work. Kim Clements, a guidance counselor at Cumberland Valley, said most AP courses are offered in the junior and senior years. The honors courses the first two years are designed to prepare students to go into them. There are students who can take only AP courses, but most of us are not that superhuman, Clements said. It’s important for students to balance their schedules to be rigorous while keeping in mind that college-level courses come with a college-level workload, she said. “You also don’t want a student to be a basket case of nerves because they’ve overdone it,” Clements said. The increase in AP programs has brought with it an increase in students overloading and having stress-related issues, she said. Clements tells her students to home in on their passions. Students should take AP courses in which they’re interested and excel, she said. And when there’s a student doing well in less-difficult courses, she’ll often encourage him to challenge himself and make the jump to AP. Students say they are happy about AP options but add the classes could be difficult. Kaplewicz is taking AP English and psychology courses. Her classmate, junior Alison Hellman, said the classes are a few notches above the honors classes she’s taken. “You definitely have to put more time into the courses,” said Hellman, 17, of Hampden Township. AP courses carry weight over honors classes on applications because they’re standardized across the board, said Dan Tredinnick, a spokesman for the Derry Township School District. College admissions officers know what’s in an AP course because it’s set by the College Board, versus an honors course that varies from school to school. “They know they’re looking at apples to apples when they’re comparing different students from different schools,” Tredinnick said. College admissions officers agree. But they look at the rigor of a student’s schedule as a whole, they added, so it’s fine to have a mix of AP and honors classes. “I’d rather see a student take a balanced curriculum with some AP courses,” said Brown of Lebanon Valley College. We shall see how the change in leadership helps CA children. Gotta stay hopeful. Against the backdrop of another smothering budget crisis, California Gov. Jerry Brown has quickly moved to put his stamp on the state’s public schools by shaking up the state board of education and entrusting its members with more power. In some of his first moves, the newly elected Democrat eliminated the position of education secretary—an advisory post separate from the state’s elected schools chief—and canned seven members of the state board, replacing them with former school superintendents, a teachers’ union activist, and a well-known Stanford University education professor. Great piece on South Texas' Hidalgo ISD. A federal appeals court panel on Tuesday upheld the use of race-conscious admissions by the University of Texas at Austin. In doing so, the judges rejected the argument that the policy is unconstitutional because state lawmakers had created a viable, race-neutral alternative to it when they mandated that public universities in Texas admit students in the top 10th of their high-school classes. Although the three-judge panel of the U.S. Court of Appeals for the Fifth Circuit was unanimous in ruling that the university's policy complies with guidelines for colleges set forth by the U.S, Supreme Court, the judges were deeply divided in their reasoning. The majority opinion, written by Judge Patrick E. Higgenbotham, attacked the state's admission guarantee based on class rank, known as the "Top 10 Percent Law," as "a blunt tool" of arguably questionable constitutionality. But a second judge, Carolyn Dineen King, refused in a concurring opinion to endorse Judge Higgenbotham's critique of the admissions guarantee, arguing that its wisdom and validity were not even considered by the court. And a third judge, Emilio M. Garza, issued a concurring opinion that heavily criticized the chief Supreme Court precedent the panel felt bound by in ruling in favor of Texas: the high court's 2003 Grutter v. Bollinger decision upholding the use of race-conscious admissions by the University of Michigan's law school. In the short term, at least, the three judges' ruling has the effect of leaving intact a 2009 U.S. District Court decision dismissing the lawsuit, which had been brought by two white applicants that the university had rejected. Patricia C. Ohlendorf, the Austin campus's vice president for legal affairs, said officials there were "extremely pleased" with the appeals panel's ruling because "the university has always maintained that its undergraduate admissions policy is constitutional and is consistent with the U.S, Supreme Court's guidance in Grutter v. Bollinger." In the long term, however, Tuesday's ruling, with its sharply differing opinions, could inspire a wide-ranging debate in the likely event that the decision is appealed. Edward J. Blum, director of the Project on Fair Representation, a group that helped represent the plaintiffs, said he was not sure whether his lawyers would appeal the three-judge panel's ruling to the full Fifth Circuit or instead ask the U.S. Supreme Court to take up the case. "The one thing we are obviously going to do is take it to a higher court," he said. The majority opinion by Judge Higgenbotham characterized the race-conscious admissions policy that the University of Texas adopted after the Grutter decision as narrowly tailored, effective, and closely adhering to the Grutter decision's requirement that public colleges consider applicants' race or ethnicity only in the context of a holistic review of individual students. Rather than challenging the university's consideration of race, Judge Higgenbotham aimed his criticism at the state's top-10-percent law, arguing that the admissions guarantee "is in many ways at war" with the pursuit of diversity endorsed by the Supreme Court in Grutter. He based that assessment partly on the law's negative impact on minority students with high-school class ranks below the top 10th of their class, and partly on university data showing that many of those admitted under the policy are clustered in certain programs, such as social work and education. Judge Garza's opinion said, "I concur in the majority opinion because, despite my belief that Grutter represents a digression in the course of constitutional law, today's opinion is a faithful, if unfortunate, application of that misstep." It said Supreme Court Justice Sandra Day O'Connor's conclusion, in the opinion she wrote for the Grutter majority, that racial diversity yields educational benefits "rests almost entirely on intuitive appeal rather than concrete evidence." And it argues that the Austin campus's consideration of race brings in so few additional minority students that it fails to achieve its stated ends. The opinion written by Judge Higgenbotham and signed by the two others makes clear that the three expect Texas's admission policy to be under legal scrutiny for a long time to come. "In this dynamic environment," it says, "our conclusions should not be taken to mean that [the University of Texas] is immune from its obligation to recalibrate its dual system of admissions as needed, and we cannot bless the university's race-conscious admissions program in perpetuity." Here's the new trend in higher education that should be closely monitored. The Voluntary Framework of Accountability, a project that aims to create national metrics gauging how well two-year institutions serve their students and fulfill their assorted missions, unveiled stage one of its proposed measures for pilot testing last week. Formally introduced two years ago, the VFA is managed by the American Association of Community Colleges and funded by the Bill & Melinda Gates Foundation and the Lumina Foundation for Education. The project has attracted the attention of educators who have long been critical of the federal government's main method of judging community colleges: the three-year graduation rate of first-time, full-time students. Still, some educators have been leery of the project, given the wide range of community colleges' missions, demographics and funding formulas across the country. Last week, the VFA announced 40 pilot institutions that will test its custom metrics. The community college testers are located in 29 states and include 37 individual institutions, two statewide systems and one multi-college district. AACC recently published the draft technical manual that these pilot institutions will use to collect data, so that other institutions can calculate their own proposed VFA outcomes and submit critiques of them. Prong one of the proposed data to be collected looks at an institution’s “college readiness measures,” such as the proportion of students who complete all developmental education; “progress measures,” such as the percentage of students retained from one semester to the next; and “outcomes and success measures.” These latter will count, separately, those who earn an associate degree, certificate or other credential; those who transfer to a four-year institution without a degree or credential; and those who leave in both good and bad academic standing. Prong two of the proposed data to be collected focuses on an institution’s “workforce, economic and community development measures.” The data points include “career and technical education measures,” such as the median wage growth of students who complete a program; “non-credit courses,” such as the number of state- and industry-recognized credentials awarded; and “adult basic education/GED measures,” such as the proportion of students who complete a GED, enroll in more postsecondary education or gain employment. The VFA, according to its organizers, is a work in progress. And they argue that this pilot testing will help highlight which measurements are most fair and practical in judging community college success. Kent Phillippe, AACC's senior research associate, stressed that “these are not the final measures by any stretch of the imagination.” He admitted that some of the measurements being required are not commonly used or may not even be calculable yet. Addressing some of the early criticism the voluntary framework has received, Phillippe said, “We’re not trying to recreate the [Voluntary System of Accountability],” a joint effort of the two main associations of public four-year colleges and universities: the Association of Public and Land-grant Universities and the American Association of State Colleges and Universities. Phillippe also noted that while the VFA is collecting measures that are “consistent across all institutions,” that does not mean that it is “always appropriate to compare them.” For instance, he said that a career and technical college may double-count some students in prong one, “the student progress and outcomes measures,” and in the second prong for assessing only its technical programs, but still decide that the latter data set is a better judge of its success when comparing it to a peer. Officials affiliated with the accountability framework, including Phillippe, acknowledge their hope that the VFA ends up influencing whatever federal reporting measures are recommended by the Committee on Measures of Student Success -- a group that was created by the Higher Education Opportunity Act of 2008, and whose 14 members were appointed by Education Secretary Arne Duncan. The panel met for the first time last October. Some members of the education secretary’s committee are closely following the VFA’s work and hope to learn from it. Among them is Wayne Burton, president of North Shore Community College, in Massachusetts. Burton also applauded the “diverse” list of institutions that are pilot testing the program, and its attempt to measure work force success. Still, he said that the final report of his committee, which is due this fall, would be unlikely to mirror VFA exactly. Some participants in the VFA pilot acknowledge that its potential influence over any federal policy is at least part of the reason for their participation. DeRionne Pollard, president of Montgomery College, echoed that sentiment. Even officials from institutions that are pilot testing the VFA are concerned about data collection. For example, Whitfield noted that KCTCS would be unable to provide the VFA with information about the state’s adult basic education and GED systems because, even though they are housed in many community colleges, they are run by the state government. She also expressed concern about her system’s ability to get through all of the VFA metrics in the time frame requested, before the spring AACC convention. Joe May, president of the Louisiana Community & Technical College System, whose system is a pilot tester of VFA, remains concerned about how it will measure work force development programs against one another, as some states will have a hard time providing data about the employment and wages of students who have finished technical programs because their data systems are not connected. He also expressed concern about the difficulty of gathering information about noncredit work force development courses, which constitute a large proportion of the offerings at some technical colleges. Still, May said that the VFA, even in its draft form, is better than nothing at all. Despite a rosy outlook from those involved, the VFA does have its critics on the outside looking in, who argue that its focus on student completion is bad for the community college sector. Brown, who is also the head of the Center for Teaching, Learning & Technology at Washington State, cites the American Association of Colleges & Universities' Liberal Education and America’s Promise initiative and e-portfolios as “more useful ways to address legitimate needs for accountability that engage students and faculty in embedded and authentic projects.” He argued that “their utility and potential” has not been fully grasped by many educational leaders. “Projects like the VFA and the VSA, though they purport to engage the good will of the educational community by virtue of their voluntary nature, are much more likely to obtund or eclipse the potential of more creative models that have better validity and, more importantly, much greater utility,” Brown wrote. According to the official VFA schedule, pilot sites are to submit initial feedback on the proposed measures and framework in March. Then, in April, the VFA board plans to vet the measures and further modify the framework.